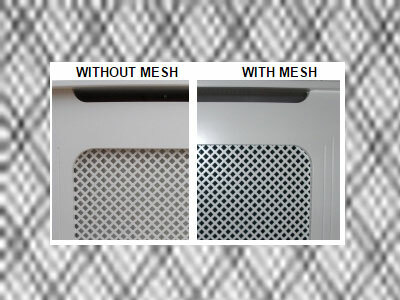 2mm x 2mm hole size black mesh allows good airflow properties while being ideal to "black out" behind the grilles on your radiator covers. This can be used to produce a nice contrast behind white radiator covers where you also have a white painted radiator behind giving a uniform dark appearance as you look in to the front of the cover. Or if you have dark radiator covers this can be used to stop the white radiator behind from dominating the effect. Made from High Density polyethylene, UV stabilised. This product is also suitable to stop children pushing their fingers through on to the radiator behind as it is made from a tough high density plastic that is not easily punctured. Important: This product is supplied loose for you to cut and fit yourself. It is not supplied pre-fitted to any radiator covers supplied (this includes made to measure radiator covers), and is only supplied in the sizes listed for you to cut to size. The product is easy to cut with household scissors. Fittings are not supplied and you can use a hand staple gun or tacker to fit to the back of your radiator covers or alternatively drawing pins could also be used.